While Carrie is a bit unavailable at the moment, I'm stepping in to fill you all in on some huge news out of Six Flags Great America. 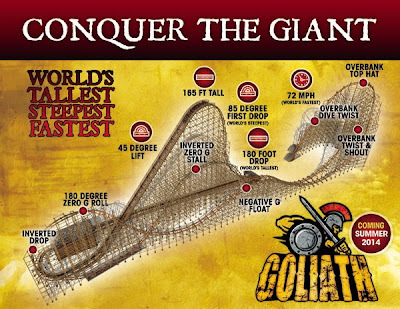 This morning, along with a ton of other announcements, Six Flags unveiled it's newest coaster, Goliath. 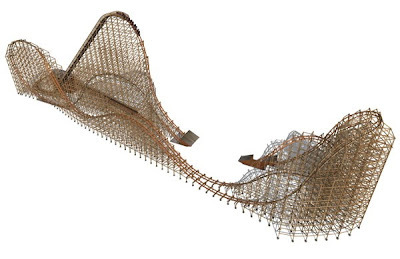 While just one of a ton of other announcements, this one has to be one of the biggest for park chain and they definitely aren't disappointing anyone with this one! 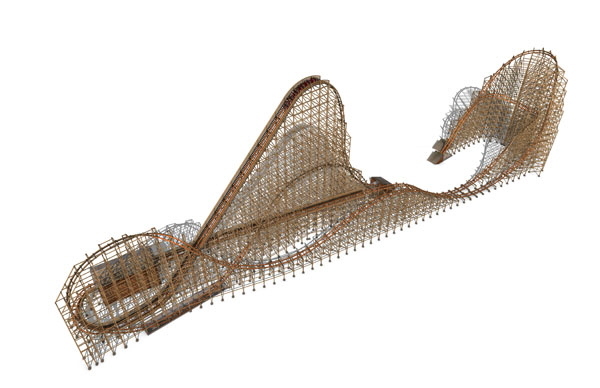 Elements: 3 overbanked turns, inverted drop, zero-g roll, inverted zero-g stall. 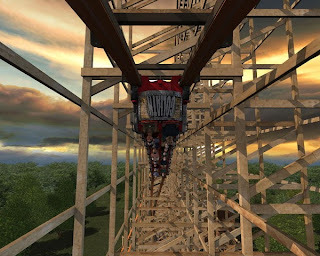 This is a massive addition to the Great America park just outside of Chicago, IL and certainly is the most extreme wooden coaster on the planet. It looks like the rumors of Rocky Mountain Coasters being in the park were dead on and instead of a retracking, they've come up with this insane monster of a ride. One of the more interesting elements (if I had to pick just one that is) to this insane new ride is the "zero-g stall" element of the ride. Whie it may look like a normal camel back, you'll be quick to realize that you're going over this one completely upside down! Can't imagine what that's going to feel like at all. Judging by the picture to the right, it's going to be completely mental to experience. Goliath will start construction in just about a month and is planned to be open in the Spring of 2014! Keep it here for more updates as we find out more information about this amazing and ground breaking wooden coaster from Six Flags Great America! Here's some more official pictures and other fun stuff from the press release this morning! Stay tuned for more updates on this and other breaking news from Six Flags throughout the day by following +Carrie H.C. on Google+ and @ISIParksBlog on Twitter!